New Delhi, February 18: Newly appointed Congress general secretary Priyanka Gandhi Vadra, who would be embarking upon a four-day visit to Uttar Pradesh before the end of the month, would also be touring Varanasi, the Lok Sabha constituency of Prime Minister Narendra Modi. Her visit comes amid a demand by the Congress cadres, seeking her candidacy against the PM in the upcoming general elections. A senior UP Congress Committee official, while speaking to reporters on the condition of anonymity, said the visit to Varanasi is expected before February 28 -- when the Congress Working Committee is scheduled to meet in Ahmedabad. Priyanka Gandhi Gets Charge of 41 Seats Including Amethi and Raebareli in UP, Jyotiraditya Scindia Gets 39. 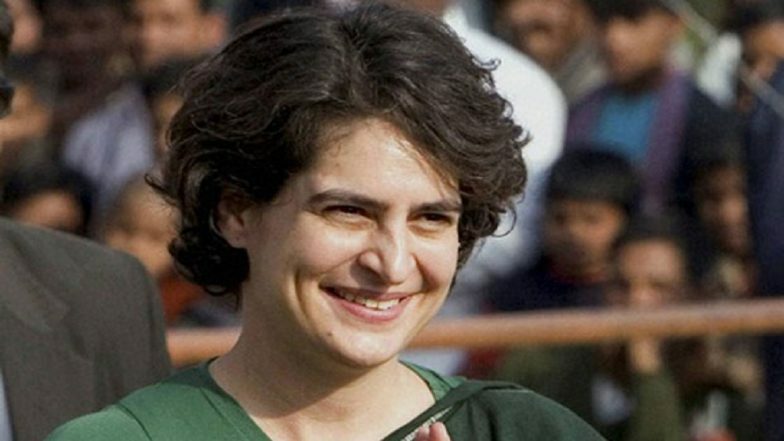 Prakash Joshi, All India Congress Committee secretary, UP, said Priyanka's visit to Kashi would further energise the party workers, who are eager to stage a comeback in the upcoming Lok Sabha polls. The BJP, however, downplayed her planned visit to Varanasi, claiming that it will have no detrimental effect on the electoral prospects of the ruling party. "After visiting Kashi, she would realise how Modiji has transformed this constituency. She would realise that this government has performed way better than her family," he told reporters. Notably, Priyanka was appointed as the Congress' general secretary last month -- as soon as she made her official entry into the party. The youngest Gandhi scion was assigned as the in-charge of eastern Uttar Pradesh -- the region which accounts for nearly 41 seats in the Lok Sabha.